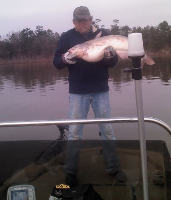 Friday 4-5 - Lake Houston Fishing! Took a while to find a spot to fish this morning due to the fog. Fished until 1130 and managed 14. One blue and 13 channels...biggest channel went 4 lbs. Don't have a temp or depth report as the new Helix just arrived today and have not installed it yet. Water was kinda brown but not too bad of shape. Quite a few boats out today. Estimating I was in 8 FOW by the anchor line. Bank fishing also picking up. 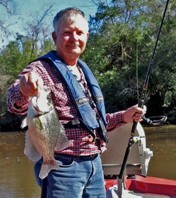 Caught 10 keepers between 9 & 10 am, near the power lines. 5 were against the bulkhead. used chicken liver and shad. lots of turtles. Bank fishing continue t be good, Caught 7 within 30 min. 9 t0 9:30. Along the bulkhead. Turtles move in at 9:30, fish quite biting. Channel cats were 13 to 17inches. bait was chicken liver. about 10 am most days. Yes sir, 22 channels yesterday morning despite the wind. Sorry no pics this time. Had to hug east shorelines cause of the wind. Sticko, Today it was good but not that good. Fished 7 to 9 am. 12 turtles, 12 channel cats, & 2 nice size fresh water drums. I don't remember the turtles being so bad in years past. Seems now every year they get worse. your not eating enough turtles to keep the numbers down. Instead of killing them or letting them go, I've been relocating them to a creek by mablebrook el sh. This is the worst year I"ve seen for turtles.